Graeme McDowell and Lee Westwood share the lead on six under par after the first round of the Malaysian Open. Both players carded seven birdies, plus a solitary bogey on the tricky par-four sixth hole, during their respective opening rounds of 66 in Kuala Lumpur. They lie one shot ahead of England's Tommy Fleetwood, Malaysian Danny Chia and South Korean Sunghoon Kang. Scotland's Stephen Gallacher and Paul McGinley are among a group of seven players tied for ninth on three under. 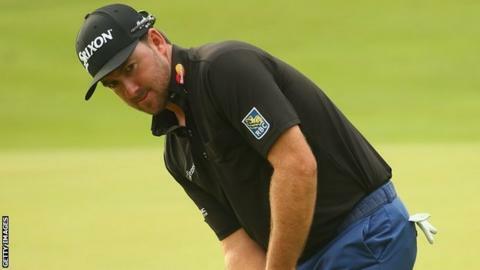 Starting from the 10th hole, Northern Irishman McDowell recorded three birdies on his back nine and followed that up with a further four birdies on the front nine. Fellow European Ryder Cup player Westwood also began his round at the 10th and picked up four shots in his first nine holes and three on the next nine. The fact that the pair top the first-round leaderboard comes as no surprise as McDowell, 20th in the world, and Westwood, 30th and defending champion, are the two highest ranked players in the field. "I left a couple short in the middle when I was fooled by the grain, but overall I'm very happy"
The duo shared ninth place at the Dubai Desert Classic last week. Westwood missed a six-foot par putt at the 420-yard sixth, while McDowell failed to get up and down from the front of that green. McDowell could have had the outright lead had he not missed from five feet at the short eighth. "I putted very nicely and started the ball on line well," Westwood told europeantour.com. "I left a couple short in the middle when I was fooled by the grain, but overall I'm very happy. It's probably the toughest I've seen this golf course play." McDowell was more satisfied with his form off the tee. "I'm pretty happy. I hit the ball great today - drove it well and gave myself a lot of looks for birdie," he said. "I've liked the way this golf course looks from the start and I enjoyed playing it; it's a solid start."